Public speaking can be terrifying, but when you care about your career progression you need to find a way to get your voice out. Public speaking is how you can share your ideas with a large number of people, stand out from the corporate crowd, and get visibility in your field. Unfortunately, if you’re public speaking skills are not up to par, it’s likely that no one will be focused enough on your presentation to really receive your message. Here are 9 scientifically-proven characteristics of effective public speakers that you should emulate to become an influential and inspiring leader. Excitement – If you’re truly excited about your subject, that feeling will shine through any nervousness you may have while you are giving your presentation. Studies show that people who label their anxiety as excitement end up feeling more comfortable speaking. Authenticity – Be yourself. If you have to deviate a little from your meticulously written presentation, do so! Although you should practice your speech as often as possible, you don’t want to memorize it! Memorizing a speech can cause you to fumble over a section if you didn’t say it just right. To excel at public speaking you must do more than just defeat your nervous jitters. You must also have confidence in your subject and be yourself while you are on stage. In order to really communicate to people through speech, you need to have passion about your subject. Without passion, your speech is meaningless. You need to exude a level of sincerity in your emotion when communicating to your audience if you want them to be moved by your presentation. There’s no need to attempt to ‘practice’ sincerity by practicing your speech with a raised voice and waving arms. Simply focus on how you feel about your top and those that you are communicating with. 16% of the U.S. working population is actively disengaged. It can be hard to be passionate about your topics when you present at work but aren’t really engaged in the activity. Sometimes, to show passion about a topic that doesn’t completely excite you, you need to dig deep into the topic and find things that interest you. You don’t have to be someone else on stage, all you have to do is just be yourself. Sometimes, no matter how much you believe in your message or how well you’ve rehearsed, if you don’t act like yourself in front of the group, your audience may view your speech as insincere or calculated. If a political candidate doesn’t seem authentic, it’s not likely they’ll win an election. If a company’s social marketing strategy appears inauthentic, their sales will not go up. If you create a page on a dating website but what you write is not authentic, the people reading are likely to pick up on this inauthenticity and never contact you. Speaking is the same way. 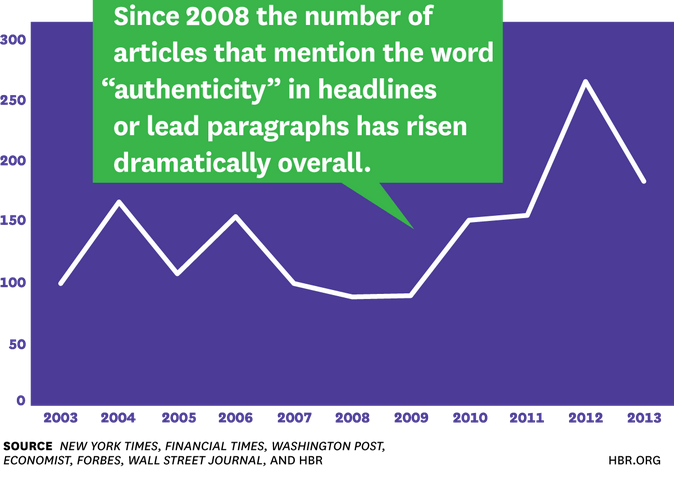 It’s no surprise that the number of articles that mention the word “authenticity” in the headlines has dramatically risen. Authenticity is important. Look at the trend since 2009 below. There are many ways to help create more ‘authentic’ speeches but a couple of methods truly shine. Practice, not memorization – In order to ‘be yourself’ in a presentation, you shouldn’t memorize your speech in absolutes. Practice your speech as often as possible, but be willing to change up the wording. This makes it easier to change it up during the actual presentation if things aren’t going exactly as planned. Memorization can set up a barrier between you and your audience. Speak in a natural voice – any connection you’ve made with your audience could be broken by tones that seem ‘fake’ or ‘too perfect’. In general, you should try to speak in a conversational tone. If you say few “ahhs” and “umms” that’s ok, don’t sweat it. If you want to be more engaging as a speaker, then avoid talking in a tone that seems too well rehearsed, but you still want to take the speed and inflection of your delivery into account when you practice your speech. Take a look at this article by the Washington Post. They discuss how the wrong tone can spoil the message of your speech. To practice proper cadence, record yourself giving your speech and listen to it later. You’ll be able to tell exactly when and where you start to sound inauthentic. You can still use effective voice modulations while employing your natural voice. If you’re only given 30 minutes to give a speech, don’t force yourself to fill the entire time allotted. Say what you need to say and use any remaining time for questions or to let your audience out a little early. The main purpose of delivering a speech is to attempt to get your point across, and that might not require a whole hour. You want to make sure that your presentation is easily digestible for those listening to you. If you can complete your speech in 15 minutes, do so, and leave any remaining time open for questions and comments. Research conducted by Dianne Dukette and David Cornish (2009) shows that, on average, adults can only sustain attention for around 20 minutes and that their short-term response to the stimulus that attracts attention is only seconds. This means that when you stand up in front of a crowd to present, you only have eight seconds to attract the audience’s attention. Additionally, if you’re presentation takes longer than 20 minutes then you need to break it up into smaller chunks with a maximum of 20 minutes per chunk of information. A speech is just like a conversation, which means you need to communicate your message to someone else. In this sense, there is no difference between talking to one person or a thousand. The problem, however, is that we’re all subject to a large amount of information in a short period of time, and it can be difficult for you as a speaker to cut through that noise and prove that what you’re saying really matters. While you’re speaking people are likely on their phones, tablets, or laptops, reading emails, surfing the web, researching who you are, or maybe taking notes on your speech. It’s your job to make them put their devices down and pay attention to what you have to say. You can’t ask them to turn off their phones, but you can make them set their phones down by creating an atmosphere that excites and engages the listeners. One of the best ways to really engage your audience is by becoming a good storyteller. This aspect of public speaking is so important I didn’t want it to simply be a bullet point in the ‘Connect with your Audience’ section. Storytelling is a powerful tool used by the best speakers. By employing context into your speech for your audience to connect with, you’re creating an easy to listen to the atmosphere in which you are not simply shoving information at them in the hopes that they’ll retain that information. The best presentations don’t feel like presentations, they are simply stories told by people with interesting experiences. You can include stories of your own experiences, or use classic stories to bring context to your speech. Martin Luther King was a master at establishing a historical context for his message. Take a look at some of the most inspirational TED Talks. TED Talks, in general, are extremely story driven, and that is one of the reason they’re so popular. For a great example of storytelling being implemented in public speaking, take a look at this presentation given by Jill Bolte Taylor. The story is the most digestible, understood, and easy to retell communication medium in the world. A story is what really sticks in a listener’s mind. When writing your speech, think about what you need to say in order to establish a context that your audience will understand and be able to engage with. Repetition can help ensure your audience takes the main points away from your presentation. It promotes clarity and helps to encourage acceptance of an idea. In order to employ repetition in your presentations, determine what you want your audience to take away from your speech. Say it. Say it again. And then say it a third time just in case anyone missed it the first couple of times. Have you ever heard someone say that they want to seem authentic on stage, so they didn’t practice their speech? Although it may seem contradictory, the more you practice a presentation, the more spontaneous it will actually sound! Of course, you have to practice it the right way though. Take into account your environment when you practice and always practice as if you’re giving your presentation to a group of people. Speeding through your presentation on the bus in a hushed voice is more likely to hurt you than help you. Practicing will help to make you feel more confident, and appear more authentic, thus creating a better opportunity to connect with your audience. Which, in the end, is the ultimate goal of public speaking. In summary, the best way to give an inspiring presentation is by having a message that you believe in that the audience can connect to. The connection between you and the audience is what allows them to truly listen to your message and be inspired. 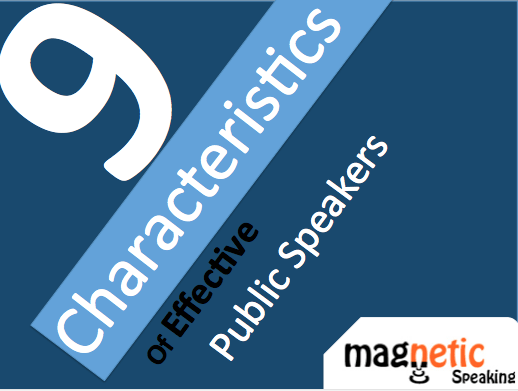 It takes a lot of practice and experience to become a powerful public speaker, and by emulating the mentioned characteristics of effective public speakers you can become more inspiring and more influential.